The Courtyard Garden (a.k.a. Recycled Water Demonstration Garden) and the Taylor Street Rock Garden were the first elements of Guadalupe Gardens to be completed. Flowering plants, turf grass, and shrubs are featured in the Courtyard Garden. The Rock Garden has the latest in drought tolerant landscaping. 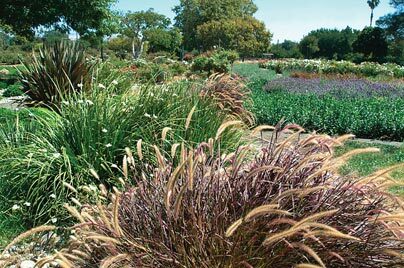 In 1999, after the irrigation system was converted to recycled water, the Guadalupe River Park Conservancy, South Bay Water Recycling and the City of San Jose rejuvenated the plantings in the Courtyard Garden and turned it into a demonstration site. The purpose of the demonstration garden is to show landscape professionals and the general public how a variety of plants react to recycled water in a landscape setting. 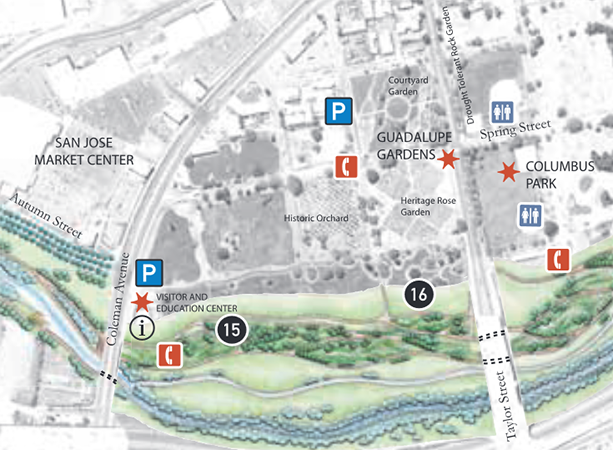 This project is an example of how the Conservancy’s mission to provide education and stewardship of our natural resources is being incorporated into the master plan for Guadalupe Gardens. The Courtyard Demonstration Garden has served as a catalyst for the development of programs to build community awareness of the availability and acceptable uses of recycled water. It is an easily accessible site for the public to visit and complements the other established areas of the Garden.